The Blackberry company was really biased since they gave up the BBM messenger to android company. Since then, they have been working hard to implement new features on there device and now they have introduced a new features on BBM. 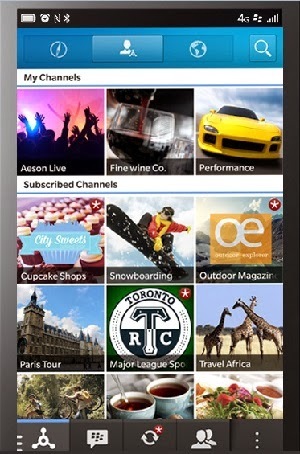 Blackberry channels is what am talking about. This latest features on BBM works just like a forum, it let you post messages, share pictures, spark discussions, debate, when you want to get in on a conversation, you can comment on a post or reply to someone else's comment to keep the discussion going. By re-posting to your own Channel you can share info you’ve found on other Channels that you subscribe to. Why You Should Download BBM Channels? To start using BBM Channels beta, update to the latest version of BBM or visit appworld. Available for only Blackberry Users at the moment. Android and iPhone users should continue using the one installed on their device. ADVICE:- We would love if you help us share this post all over the social networks by just clicking the share button below. hmmm nice information sharing with us thanks for it i like it.